Pretty good result for 12 minutes to run 3 km in should be noted that the result achieved can only be prepared by a person who does not indulge himself to the cigarettes, and in General, run for it a regular thing. If you want to know what else need recommendations in order to run for 12 minutes, 3 km, read this article. Learn to breathe correctly. If you do not know how to breathe correctly during the course, then you won't be able to run it, or run with a large amount of energy. Breathe in every two steps and exhale on two steps. Initially, it will be difficult to adjust if you never did, but then the breath will have you on the machine. Strengthen the heart. A strong heart is necessary for the development of endurance. To develop it, you need to seriously do a cardio workout. For such training developed a lot of different exercise equipment such as exercise bike, elliptical trainer, rowing machine. Although you do not need to enroll in a gym or buy expensive fitness equipment, if your goal is to strengthen hearts, to run a specific distance in a specific time. Bike you can substitute Cycling, elliptical, Jogging on skis, a rowing machine can be replaced with a boat or kayak. Also to train the heart muscle fit running, intense Hiking, long swim at the pool or in the pond. Stop and go to work or school transportation. Hop on your bike or go by foot if distances allow. Do not use elevators, walk the stairs on foot. Of course, if you don't live and work on the hundredth floor. The trained heart will help you not to turn sour in the middle distance and to maintain a given pace for all three miles. Don't undermine yourself to the respiratory system. In order to run 3 km in 12 minutes, your average speed should be about 15 km/h. now think about it, if you can maintain that speed throughout the race, if you smoke. So don't complicate your task by extraneous factors. Divide the distance into 3 equal segments for 4 minutes. The first hundred metres you need to run fast enough, rest 4 minutes, run easy, not much bothering the body. The next 4 minutes you need to run moderately fast, but running was not a burden, otherwise forces are run is not enough. The remaining time will have to work and run at the expense of character. In the last hundred meters is still to strengthen his will and to finish with the maximum rate at which you are capable. "I want to be healthy – run! Want to be beautiful – run! I want to be smart – run!" - the famous phrase that came to us from ancient Greece, is quite true. Running, without a doubt, helps to maintain good physical shape and improves health. In order to successfully run 3 kilometers, you have to train and prepare. This distance is quite large, to overcome it immediately can not every. Before you run 3 miles, you need to practice. Start the morning with a small charge and run. For a start will be enough to run 1 km a day. It would take too much time to overcome this distance can be for 5-7 minutes. If you have a bike, it is will help you to prepare for the race. Drive daily several kilometers, and it will help you to pump up and prepare the legs. The main thing in running is, of course, breathing. To breathe during a cross through the nose and exhale - through the mouth. It is recommended to breathe every 2 to 3 cross-country move, and then exhale for the same number of steps. The mouth should be slightly open even in the breath. Before the start of practice breathing, do some deep breaths for 30-60 seconds. Before you can start to chew on mint gum - it will help to ease breathing. Before the race you need to be in good physical shape. Be sure to catch up on sleep! You should have enough power, so in the morning must eat Breakfast. Breakfast should be easy enough, but high in calories. Best Breakfast of porridge, boiled in milk. You need to eat no later than an hour before the race, or to run 3 miles will be hard. Not stabbed in the side while running, you can drink some sweet water. Before run need a little warm-up. Jump up and down, poprisedayte, pull the muscles of the legs and hands. Warm-up should not be too hard and intense, otherwise you will get tired. But not to stretch otherwise you risk damaging the muscles. If it's hot outside be sure to wear something on your head. To run under direct sunlight is very difficult - you can get sunstroke. A lot of people very helps music. Modern players are small in size, easy to take along on a jog. Put that music that you always want to dance and run. As for shoes, it is best to run in sneakers, not the sneakers. Running shoes outsole better follows the curve of the foot, so the muscles bear less load. You can not be able to run, but to learn how everyone can. There are exceptions related injuries or injuries inconsistent with the Jogging, but in all other cases, you can learn to run quickly and for long distances. Running gives a good load on the heart, ran a few kilometers, you can easily assess the state of health and physical training. To learn to run long distances, for example, 3 km, you just need to do it. Regularly run is the path to success. Start small: just run in a quiet pace as much as allows breathing and endurance. Usually untrained people can not withstand more than 1 km Every day runs a little more, at least for the 100m. And after some time, the goal will be achieved. When you run, the most important - breathing. Don't start with the fast pace. Run slowly, but so that the breath does not get off. The first time it won't happen, but after a few workouts you will be able to run, and your breath will be safe. Accelerate if you want it, at the end of the race. Running in the company – not the best idea. You may think that the company will be more fun, but in reality, talking while running, still will not work, but catch up with someone – not nice, and I'm sure it will come. Therefore, exercise alone. Run at a convenient time. It is believed that need to run in the morning, but this mode is not for everyone. People react differently to the earlier time of the day, and if someone in the morning feeling strong enough, others will prefer a quiet run in the evening. Don't be lazy. The first few days you will keep the enthusiasm, but over time it will start to fade. Remember that the first missed run – way to end your run. So you reach the result you won't learn to run even 3 km. Achievements are counted. Every day run a little farther and be proud of yourself. It is very stimulating for further results. Do not have to run every day, but you must train regularly. Best: 2-3 times a week. So your muscles, on the one hand, will be used to load, on the other, will have time to recover for the day. To run better on the street and not at the training hall. Buy a player, create a good playlist. From time to time update it's including new music. A change of scenery, and the oncoming people and music will not let you get bored while Jogging. Pick up comfortable clothes for running. If you experience discomfort due to shoes or any item of sports uniform, buy the other. You must be comfortable and pleasant to train. Run learn quickly under the guidance of an experienced coach, first running technique matter, eliminating the error you can run 1.5 or 2 times faster than usual, and secondly, the coach will tell you what exercises to do. To increase speed you need to choose a method of training that requires adequate equipment. 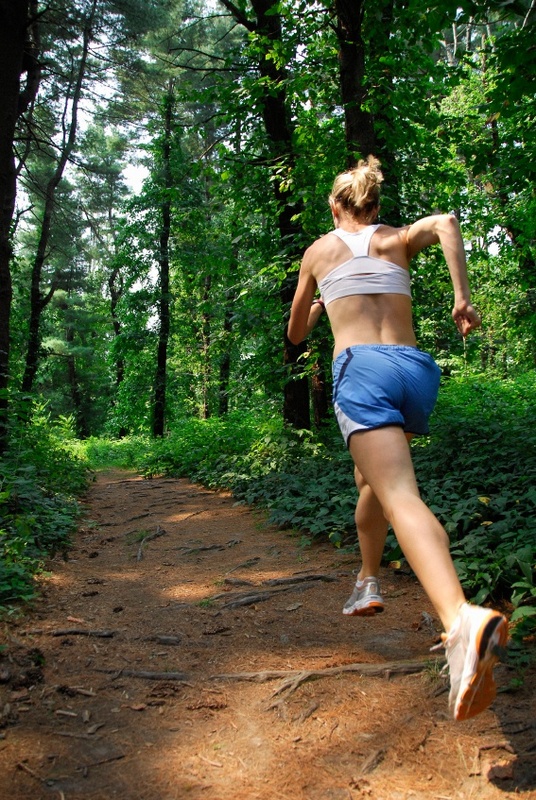 The most effective method to learn to run fast, running on a variety of terrain.